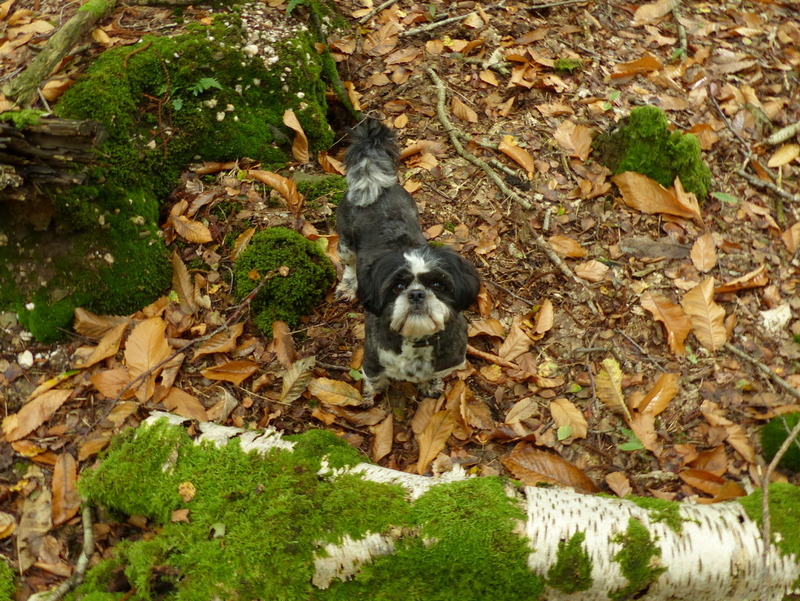 We had a request to do fungi a couple of posts back and so yesterday Fizz and I set out on a Fungi Foray. 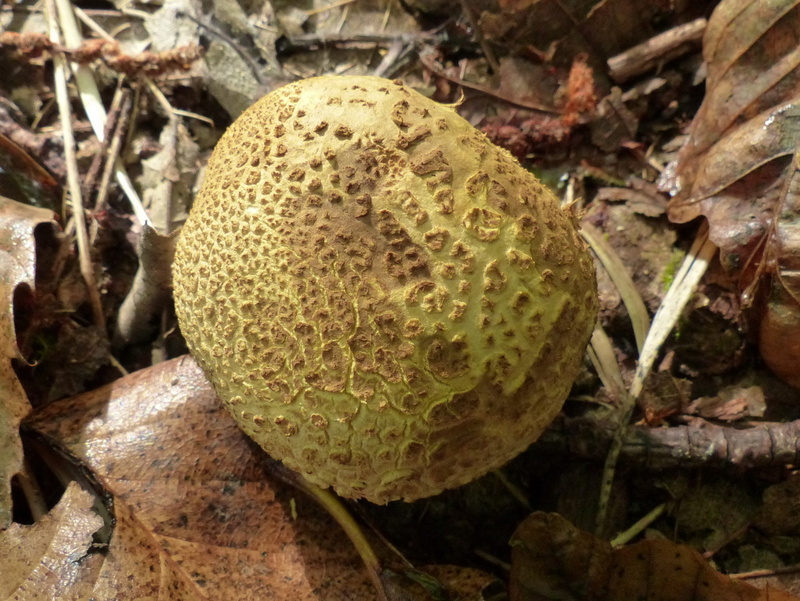 This one is Scleroderma citrinum, another name for it is the Common Earthball. 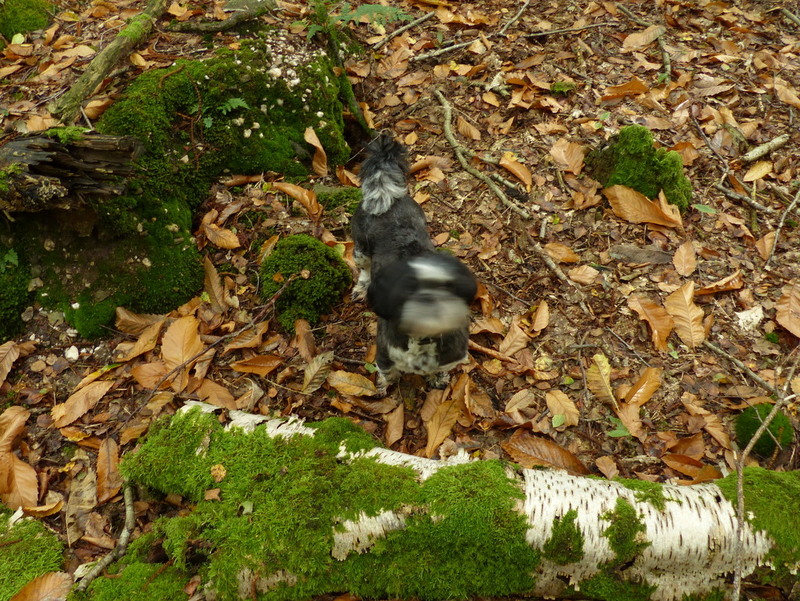 I set off to explore a derelict Sweet Chestnut Coppice. There are a lot of fallen trees and rotting wood and given the time of year and the recent rain I felt that I had a good chance of finding something exciting. She had trouble understanding that if you want to have you photograph taken in the forest then you have to stand very still because it is dark. 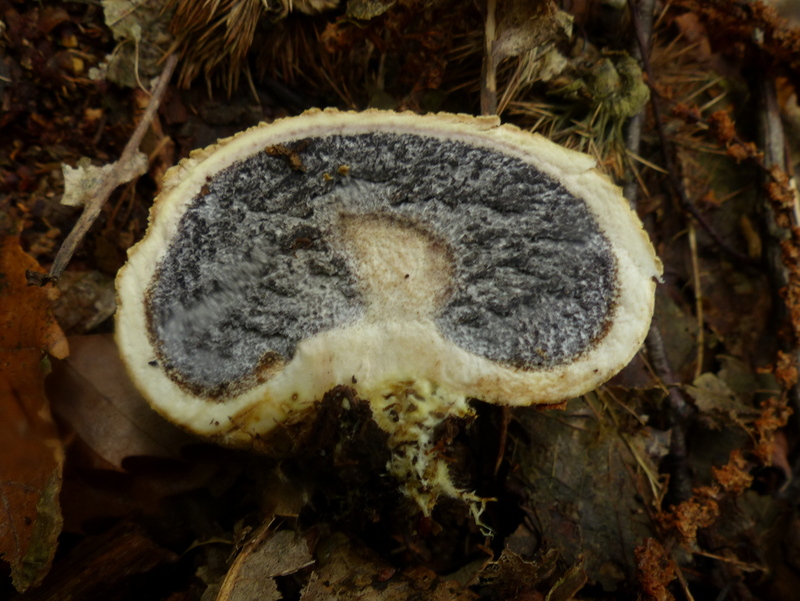 This is not a particularly bad fungi, It is what I would call a “Rum Bum and Tum” one. Ingestion of the spores can cause gastrointestinal distress. It certainly isn’t edible. 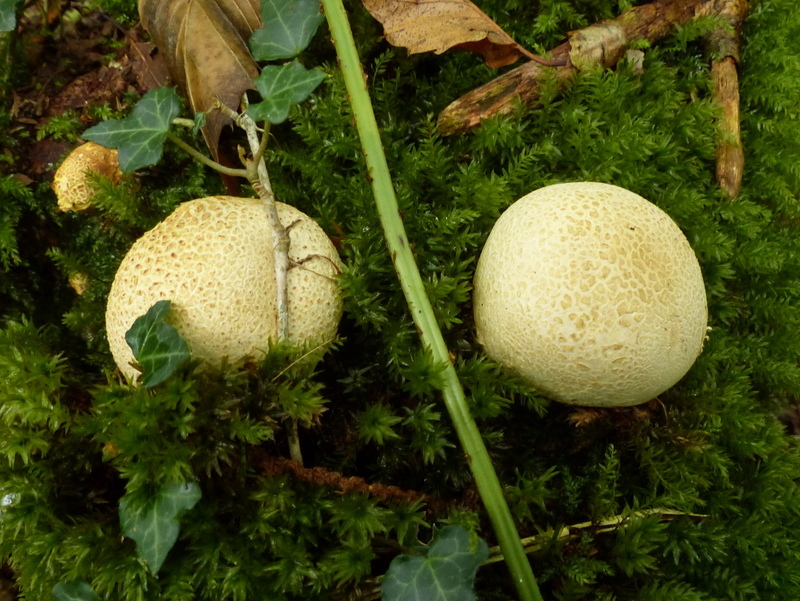 It is very difficult to mistake this for an edible puffball which has a white or creamy white centre whilst this one is quite black in the middle. 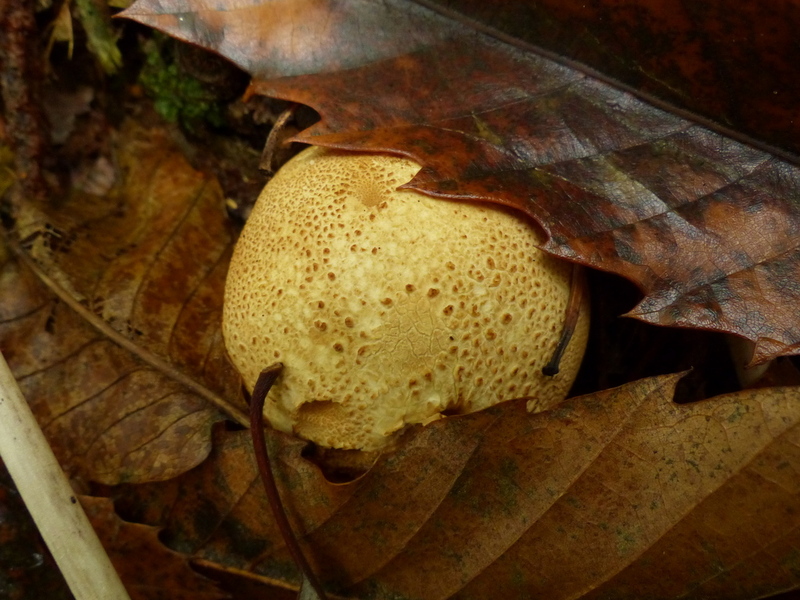 It is composed of a very thick skin with spores inside and that is about it. It is the spores that you want to avoid. 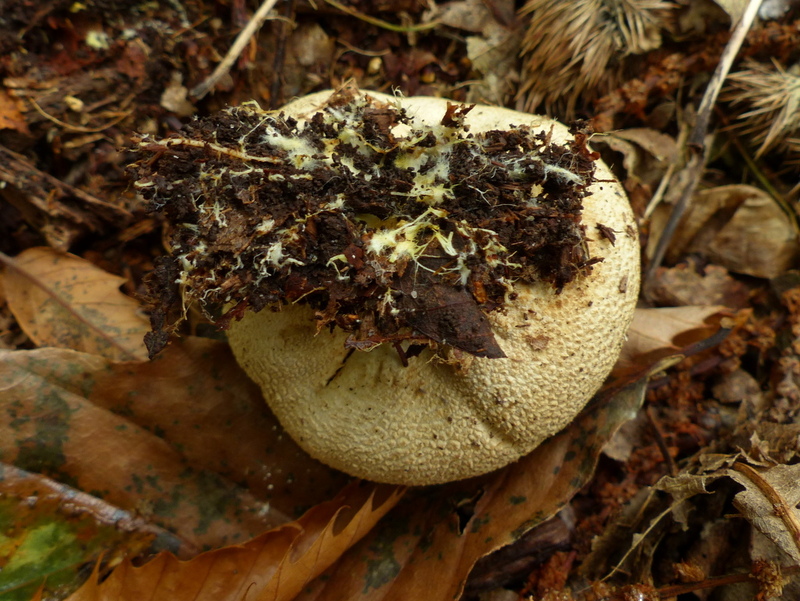 As the Earthball Matures the spores inside turn to dust and then the skin splits and the spores are carried away on the wind. Some people like to stamp on them and see the dark cloud of spores engulf their feet, that is fine, it is just what the mushroom intended to do any way but I would recommend being at least six foot tall. The further your mouth is from the spores the better your chances of not embarrassing yourself later in the day or experiencing discomfort. I trod on a couple yesterday, quite accidentally and had to go to pains to steer Fizz around the cloud that appeared as a result of my clumsiness. 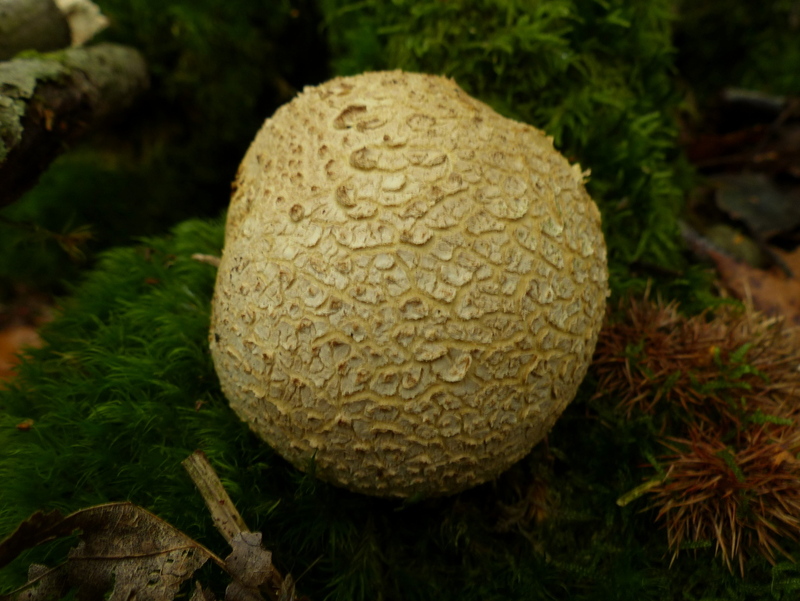 The Common Earthball has no stem, it is attached to the ground by the white threads of the mycelium. 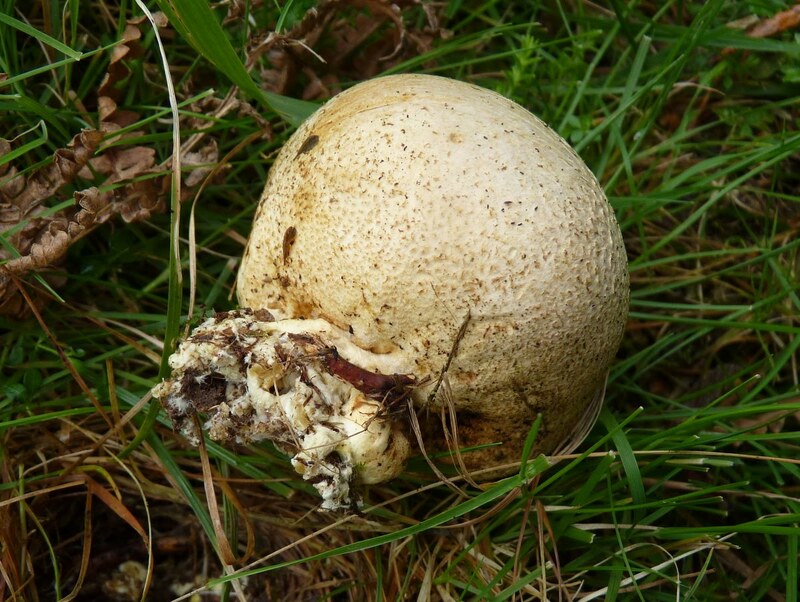 There is another fungi that exists as a parasite on the Common Earthball called pseudoboletus parasiticus. 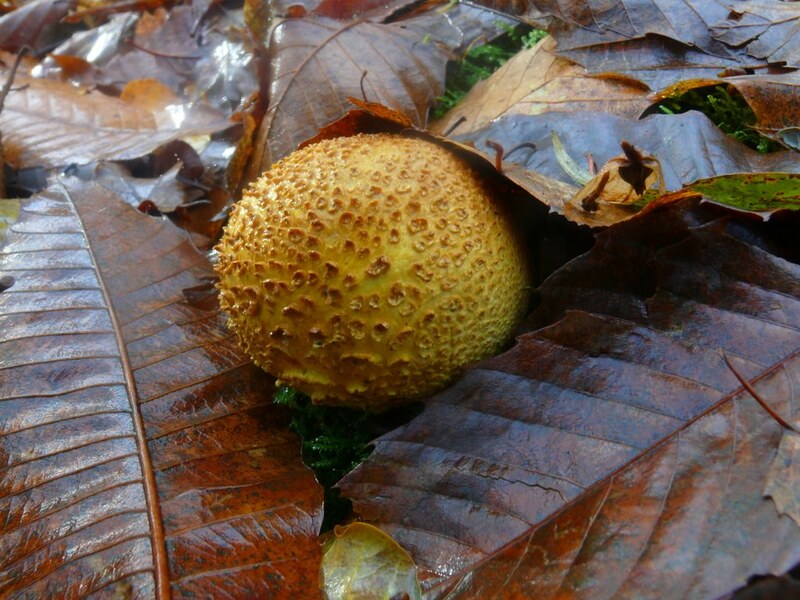 It is very rare and can only exist in the company of Earthballs. It looks like this. That is not a great example but it is the only one that I have ever found. 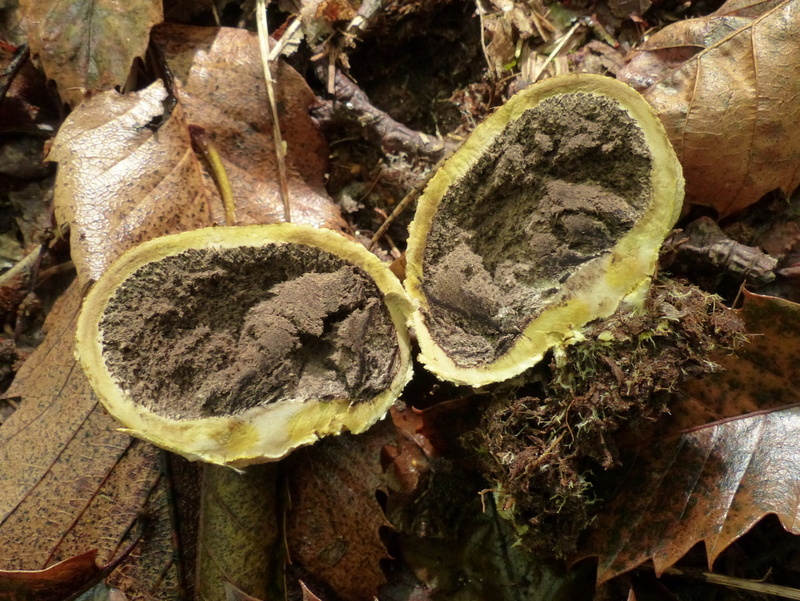 The thick skin of these fungi breaks down slowly after the spores have been released and it is common to find these empty yellow skins quite late in the winter. So what is it doing in the forest. 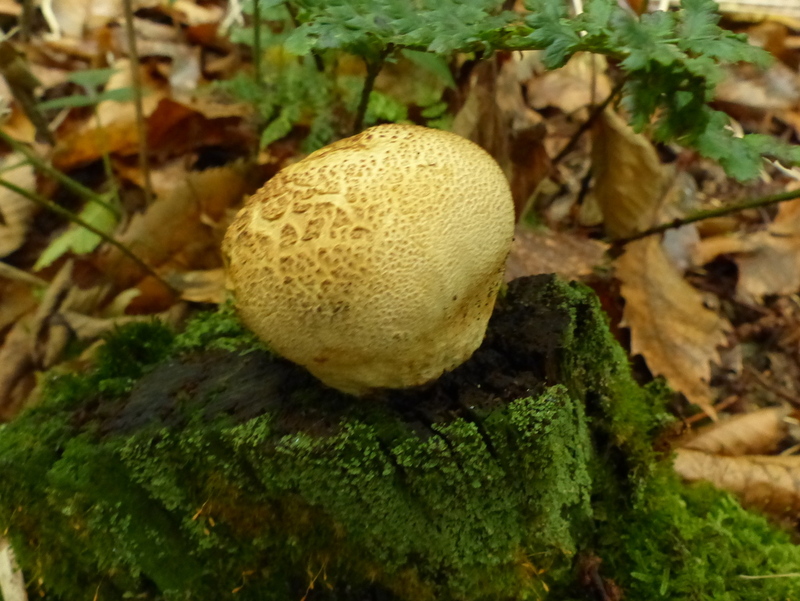 Well it is a mycorrhizal fungi and that means that it has a symbiotic relationship with the trees in the forest. The fungi connects with the roots of trees and exchanges water and minerals in return for carbohydrates. Both the tree and the fungus benefit from this relationship. Now I can not find this written down anywhere but I feel sure that it must also have a role in breaking down dead wood as I very often find the fruits emerging from rotting wood. 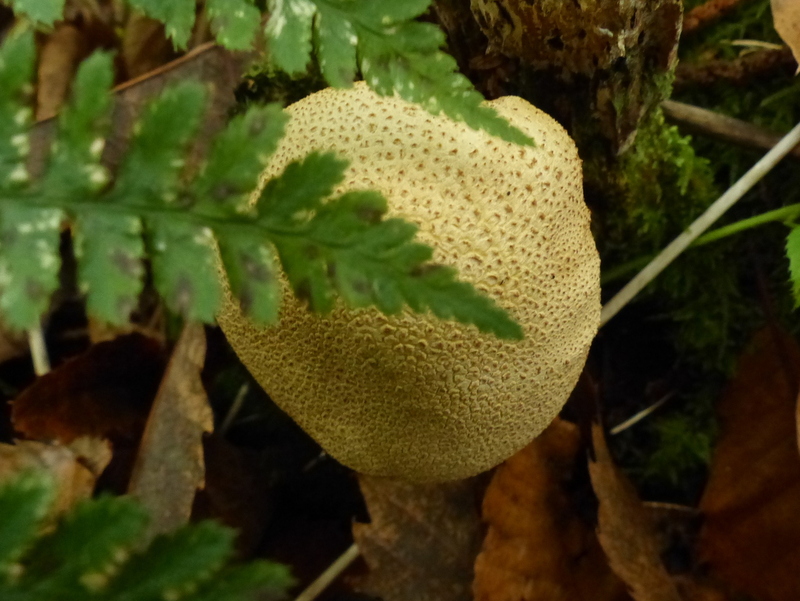 That is the Common Earthball, Scleroderma citrinum. There is so much variety in the fungi that you see, and great stories. And as kids, all we used to do was kick the buggers around and not give a damn. Now you make it so much more interesting. Thank you John 🙂 I am fascinated by the variety in Fungi and also the roles that different species play and the way that they interact with plants and animals. Expect a lot more fungi here soon. I learn so much from your posts and the photos are a huge bonus. Very good indeed. What a fine truffle hound too. I’ve never seen these before! Thanks for teaching me something new! Thanks Tam 🙂 Here in the UK they are very common in Sweet Chestnut woodland of which we have rather a lot. That is really the only place that I find them but I know that they do grow amongst other trees. Thank you, I enjoyed learning about the different fungi. 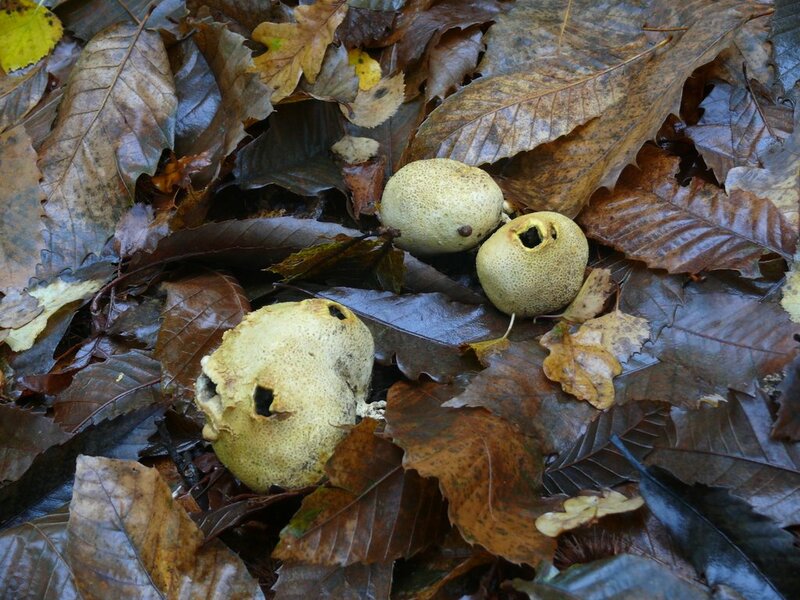 These look a lot like the Puffball that I have eaten here in the States. But they are not black in the center; rather white throughout. I enjoy going on the walks with you and Fizz since I am city-bound currently. Thanks SE 🙂 I keep reading that people can mistake these for edible puffballs but that black heart must give it away. I hope that you can get out of the city soon. I like this entry, a lot 🙂 Very interesting, thanks ! Any idea what results from the inhaling of these spores? I TA a course with sample dried specimens and always worry students may get too close. 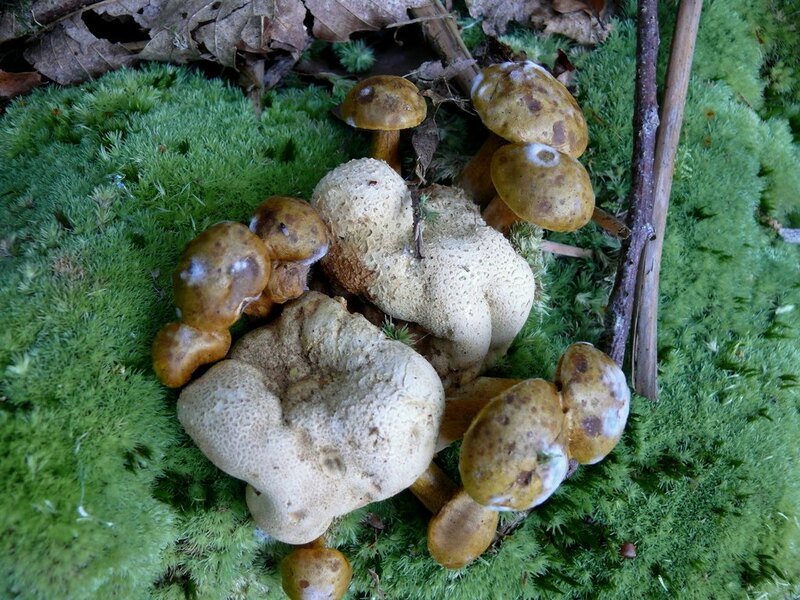 The spores of this fungi are poisonous to some extent. They are known to cause gastrointestinal distress in Humans. It is also linked to problems with the eyes (Conjunctivitis) and nose (Rhinitis). Kids kick these mushrooms about all the time and don’t seem any the worse for it but.. surely there are guidelines for exposing students to poisonous fungi? The spores have been linked to lacrimation (Crying) and Rhinorrhea (Runny nose) in some individuals and the spores dry to a dust naturally before being ejected. I would think that it was almost impossible to harm students in this way but in these days of litigation should you knowingly expose students to poisonous spores? If you tread on one of these Earthballs a thick brown cloud of spores comes out and engulfs your feet, If you stamp on it you get a much bigger cloud. I certainly would not want to inhale from that cloud but a few spores on a microscope slide? well, I don’t think that could hurt anybody. Learning is fun at atrampinthewoods. Thanks for the info and the great photos. I learn so much from your posts. Were you a teacher? I adore mushrooms ~ their color, their variety, their earthiness. Thanks for the tutorial!